Hate-Fueled, Lovingly Crafted Christmas Cards. A couple of weeks ago I got served some sponsored posts that made me very angry. It was an illogical anger – holiday-induced-insanity even – but it happened. The first one occurred on Instagram. First let me say that I do not follow Melissa Joan Hart. I do not follow any celebrities (with the exception of The Big Bang Theory Cast because they’re funny and I do not really know why I follow them but I do.) The fact that I was getting sponsored posts not from brands but from celebrities really irritated me. At first I didn’t know why it angered me so intensely, until I got the second one – this time on Facebook. I don’t follow Melissa Joan Hart at all but I don’t follow Tori Spelling even harder. Getting two in a row, from different social platforms, really helped clarify what I hated about these ads. Even more helpful was discussing them with Not-Crazy-Renee. Being each other’s Spirit Animal often enables us to articulate the whats and whys behind what the other one is currently hating, even when it’s petty and ludicrous. So let’s bullet journal the reasons my heart was overflowing with holiday hate. ● I have enough angst and guilt over my short-lived season of family photo Christmas card making (was it 2012 and 2013? Or maybe 2011-2013?) that I do not need celebrities I don’t even like showing up in my feed to humble brag about theirs and remind me that I don’t have it together enough to make that happen. ● Really, Tori? 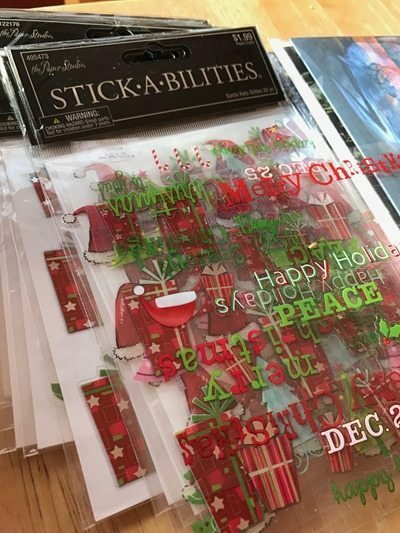 You’re unveiling your holiday card? As though there is a crowd gathered around you with bated breath, just dying to see your Christmas card? Oh wait – I guess since you sponsored the post, that answers the question. You’re going to force us to attend your unveiling whether we want to or not. ● The name of the company that is underwriting these ads – Simply to Impress. Yes, that’s the holiday spirit we’re all trying to get back to. That’s why we send Christmas cards. That’s the Reason for the Season. 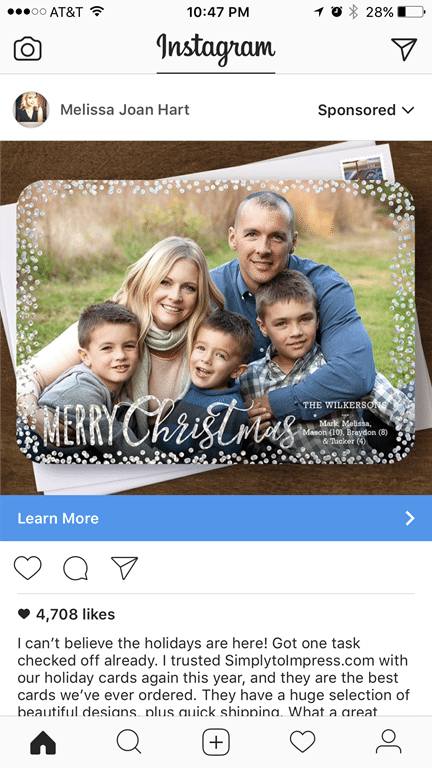 ● And Melissa – it’s super obnoxiously cute that your friends and family know you’re actually Melissa Wilkerson and not Melissa Joan Hart. 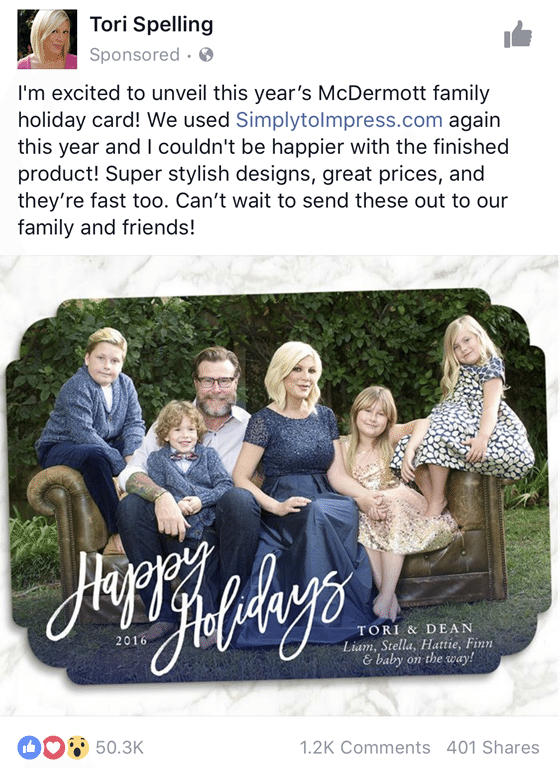 It’s a good way to show that you’re totally a real person, and not a celebrity bot living a perfect life and sending out Christmas cards simply to impress. ● Tori, how embarrassing was it for you to have to go into your Facebook and BUY a sponsored ad? Isn’t the point of being a B-List celebrity that you have the world’s attention? I mean sure, Simply To Impress reimbursed you for your social media sell-outedness, but tell me – was it worth it? Did that little paycheck really make an even more lavish-on-the-leather-couch-outside lifestyle that much more attainable? I spent a week hating on these posts in the darkest, least Holiday-Spiritest parts of my soul, then another week hating on myself for not winning at Christmas enough to send out my own Christmas cards. Also because I really LOVE to address Christmas cards all fancy-like. It’s a favorite holiday tradition. 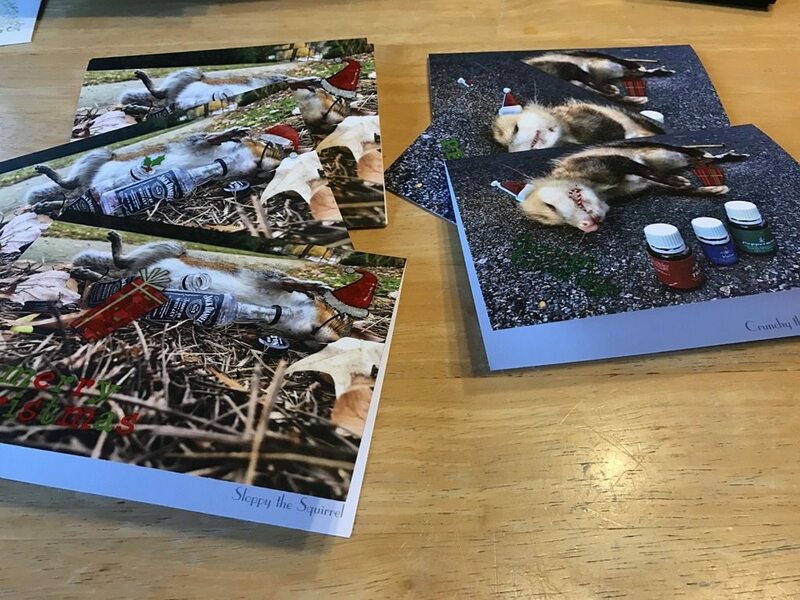 And then, in a flurry of inspiration and dark-mindedness and manic preparation and fancy writing, I decided that I would, indeed, send out a small batch of Christmas cards. I took my list from the previous years and pared it down a good bit, then asked my blog readers if they would like a Christmas-Ish card. 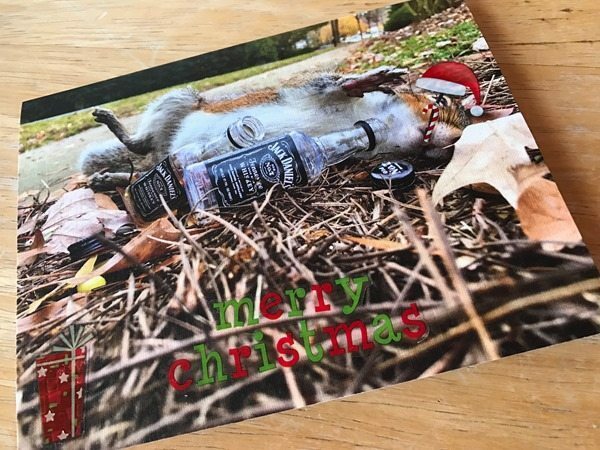 Because really, these Christmas Cards had to be wanted – they best arrived anticipated, not out of the blue and unexpectedly. I hurriedly ordered a new batch of my favorite creation of 2016 and then ran over to Hobby Lobby and bought decorative stickers. 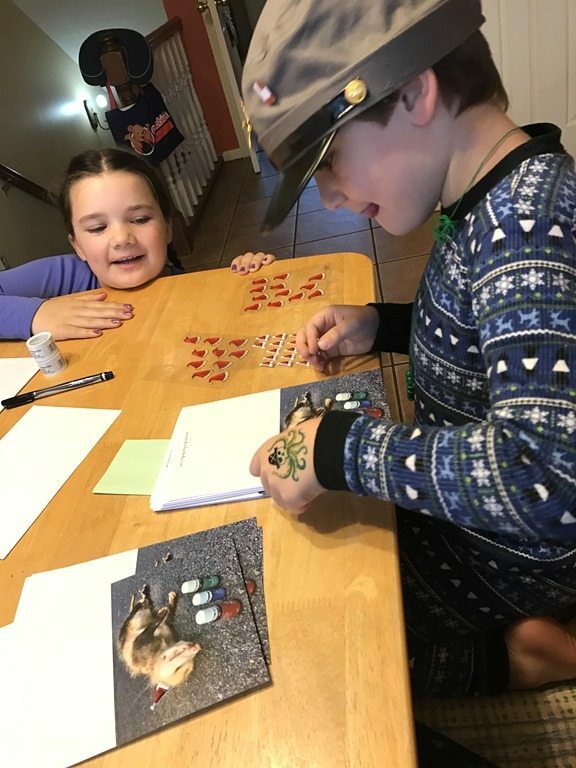 Then, attempting to make each of the cards unique, Noah and I set out on a holiday deco-fest, while Ali preferred to watch in wonder. 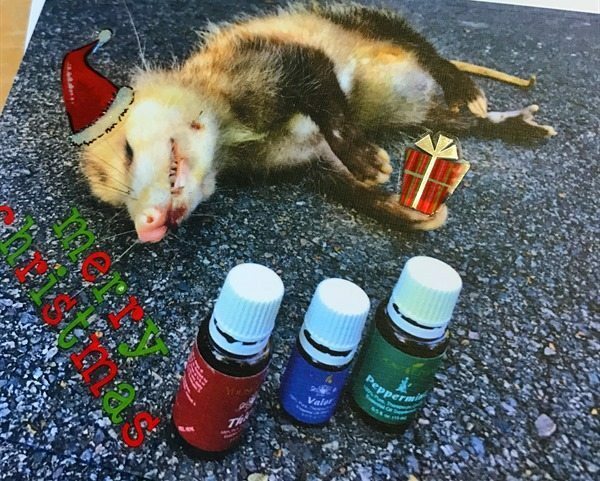 Sloppy the Squirrel and Crunchy the ‘Possum were redeemed, one by one, into a beautiful celebration of the holiday season. Because nothing says Jolly like a ‘Possum and her oils. 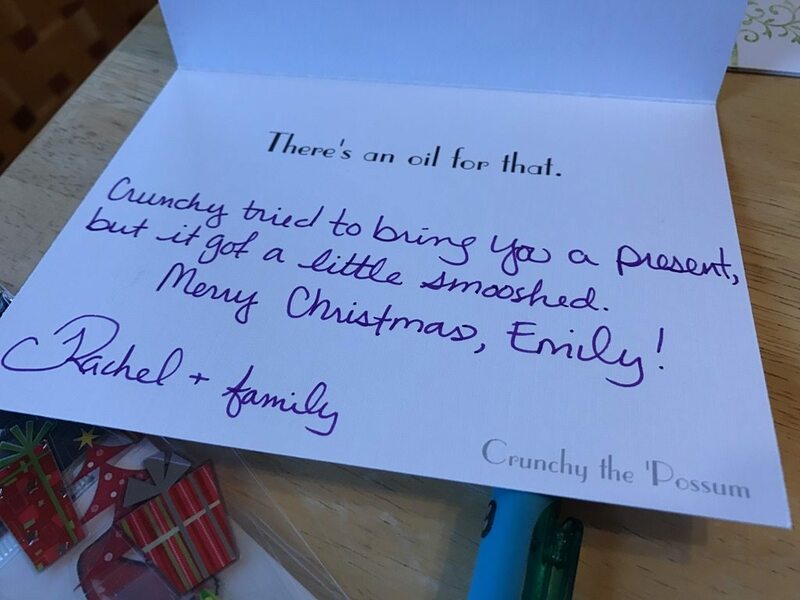 I have never in my life had so much fun with Christmas Cards, giggling as I created each one – especially when I realized that Crunchy was able to hold a small gift. And I knew that my goal was to add some levity amongst all the cards that my friends and blog readers would be receiving this season. Lest you miss the gravity of the moment, this is a story of redemption. Because just as Crunchy and Sloppy had been redeemed for the holidays, so had Melissa and Tori, along with my Happy Holiday Heart. Because yes, I despised them and their obnoxious sponsored posts, but ultimately they drove me to the cheeriest Christmas card making of my life. And even thank you, Simply to Impress. I am certain that this outcome was your exact intention. Editor’s Note: If you didn’t receive a card from me this year, I apologize. 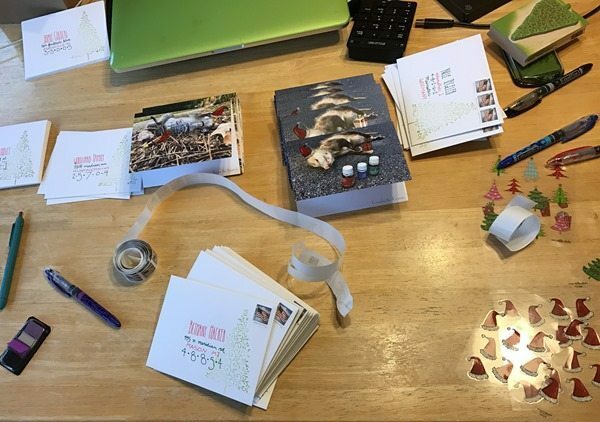 I sent out a much smaller batch than usual due to the labor-intensity, the limited number of cards on hand, and not wanting to cause any queasiness in those who hadn’t been slowly immunized to my sick sense of humor. 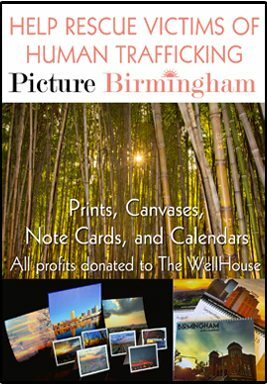 If you would like to receive a card, albeit late, email or message me your mailing address. Maybe Crunchy and Sloppy can be repurposed for New Year’s, Valentine’s or Easter. 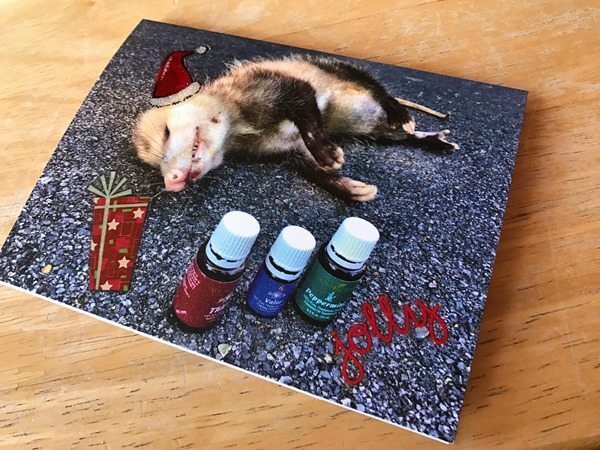 If you would like your own set of non-holidayed Roadkill Note Cards to send out to your friends and family, they can be purchased here – with 100% of the profits being donated to The WellHouse. 7 Things Better Than a Debate. Tonight is the first presidential debate. Apocalyptic or not, a debate between Trump and Clinton is perhaps the last thing I want to watch, especially since they’re not even letting any third party candidates in to chop up the madness into more palatable bites. But watch I will. Or at least sit in the room while Chris watches it and I stare at my phone. However, I do wish that the Beings in Charge would have conferred with me as to the setup of this debate. Because I have a few ideas. A few million ideas possibly, but definitely a few ideas that would make this whole showdown less nauseating. After all, we live in a Media-Crazed Reality-Show world, which is partially to blame for the situation we find ourselves in now. So why not utilize those setups and make the whole catastrophe at least more interesting, and possibly even more informative? Let me present a few of my ideas to you, since no one else has asked for them. 1. A dinner at Downton Abbey. I think the IDEAL way to truly grasp the candidate’s ability to handle such a high-stress job would be to have Mrs. and Mr. Clinton, along with Mr. and Mrs. Trump, attend a dinner party with the Crawleys. 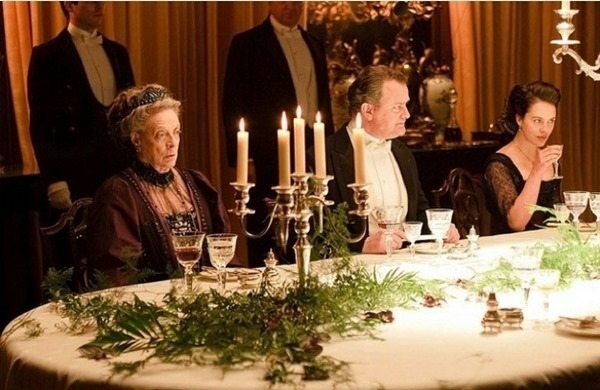 The Dowager Countess, of course, would be in charge of questioning the candidates. After leaving them both at a loss for words with her endlessly witty smackdowns, she would concisely pass her judgment. I agree, Violet. I agree. I think the important skills of avoiding the sting of Tracker Jackers, the jaws of Wolf Muttations, and no matter how hungry you are, not tasting those delicious looking Nightlock berries would be a good judge of ability to be the President of the United States of America. And hey. If a face full of Tracker Jacker stings left one or two opponents unable to run for office anymore, I think America would be able to recover from their loss….eventually. 4. A Day of Alabama Football practice. They don’t even have to practice football. 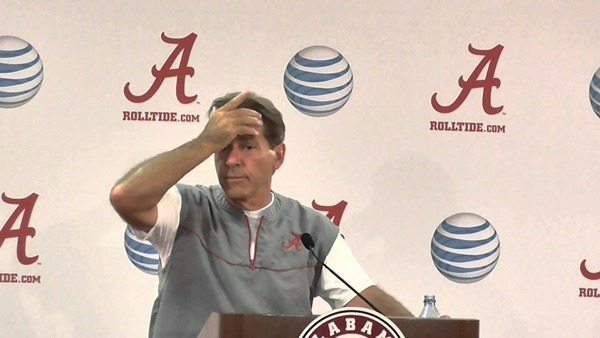 Really any situation where Saban can yell at them for a solid eight hours and then have a press conference where he talks about how vastly disappointed he is in the both of them would make me blissfully happy. 5. Swimming with Michael Phelps. That’s just because I want to see any mortal swim next to Michael Phelps. But Hillary and Donald would be especially amusing – most notably watching the orange hair (and orange chest hair) flap about in the pool and seeing that pantsswimsuit. 6. The Apprentice – Presidential Edition. In this hit show, both contestants would serve in a one month trial presidency under Barack Obama. They would compete in important presidential skills, such as negotiating peace treaties, wrestling with massive lose-lose policy decisions, rolling Easter eggs on the White House lawn, and eating monkey brains with the King of that country in Indiana Jones and The Temple of Doom. Who can eat it with a straight face and presidential flair? Who hears “You’re Fired!”? Find that fantastic kid Max who wished his Dad couldn’t lie for 24 hours, and then pay him a million dollars to wish the same about Hill and Don. Then ask them each a question per minute for the entire 24 hours. OH. MY. GOODNESS. The glory. What would you create to replace the presidential debates? Make it good. Give me something to read and laugh about during the torture tonight. posted on May 6, 2015 by Rachel Callahan · 15 Comments Filed Under: "Deep" Thoughts by Rachel, Rachel's "Brilliant" Marketing Ideas, This is TONGUE IN CHEEK People - Don't take me Seriously. 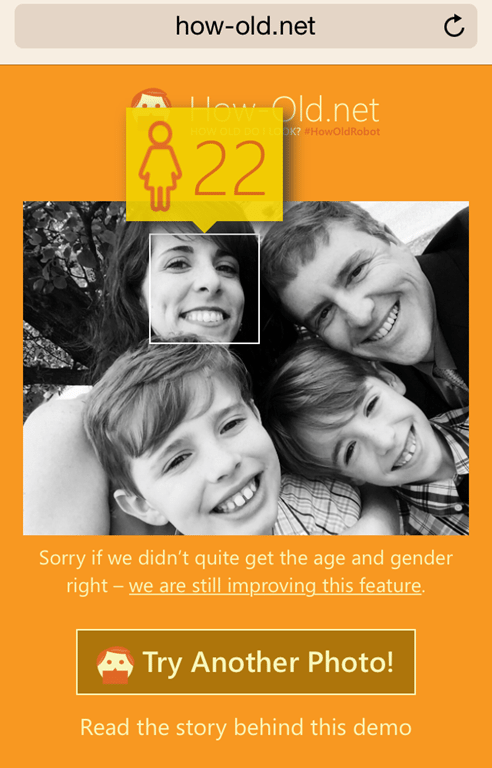 It has been discovered today that how-old.net, the currently viral website that allows you to upload a photo and then tells you how old you look, is actually a conspiracy by multi-level-marketing behemoth Radon + Folds. 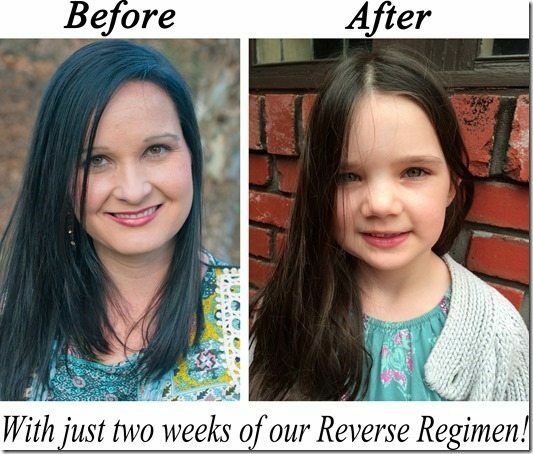 Redarn + Flan is a direct sales skincare corporation that relies primarily on women who don’t mind utilizing Facebook to continuously show before and after pictures of people transforming from wrinkly to very very shiny in a matter of weeks by using their simple twenty-step regimen that costs approximately $48,342/month. They have created the recently popular meme website to drive the online world to feel older than they actually are, and therefore run to their Rhonda + Filed-selling Facebook friends for deliverance. The website does not, however, tell everyone that they look older than they are – a fact that has kept their brilliantly manipulating marketing ploy from being caught up to this point. 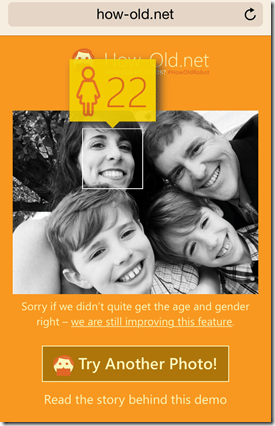 Their strategy is much more involved, including employing a cookie onto your computer that searches your browser history to see if you are already seeking younger looking skin. If searches are found that indicate you as a prime candidate, as easy prey, as ready to be picked, then the cookie checks your Facebook friends to ensure that you have an ample amount of Razed – Fence salespeople in your life. This process takes less than .05 seconds. 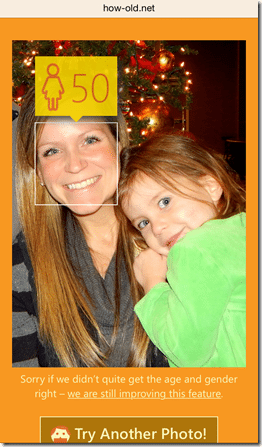 If you are indicated as a Randy @ Flart target audience member, you are then told that your picture looks approximately 5 – 10 years older than it actually does, sending you into a tailspin of despair, which only adds to the wrinkles on your forehead. 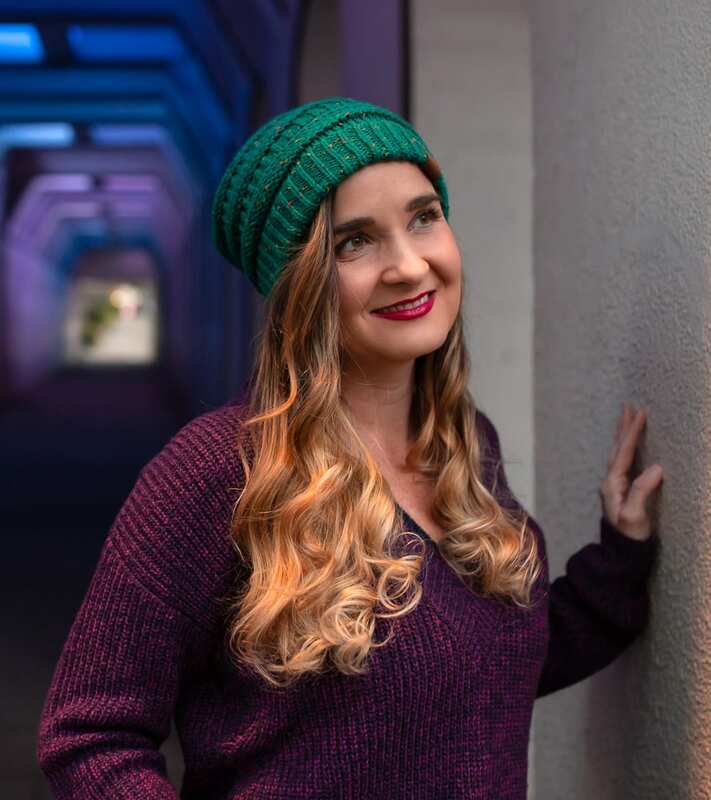 Who, after running a dozen different pictures of herself and getting increasingly ridiculous answers, asked a friend to submit her photo – a friend who happens to be older than her. 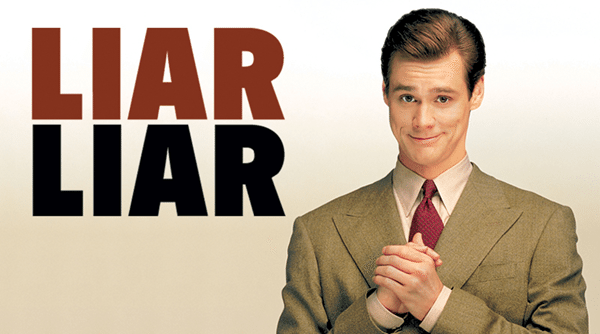 The program is trained to recognize when a person gets so worried that they begin running other people’s faces, and so it reacts in a way to make the person in question even more concerned. And concern creates more wrinkles. Which makes them even more ripe for the Ruby + Tuesday harvest. 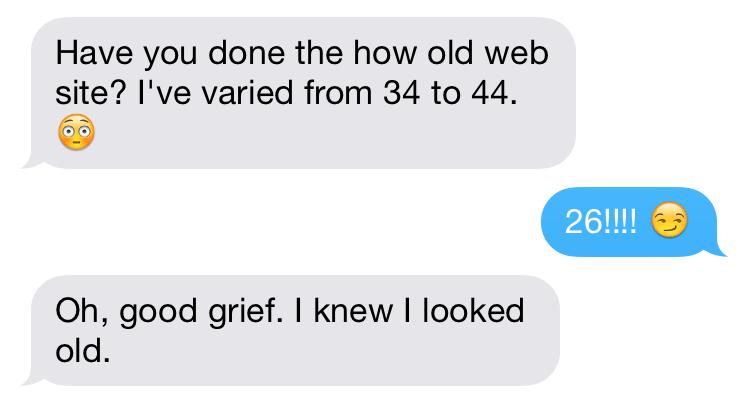 This personal then typically texts their friends in a panic, pleading for them to tell them that they don’t really look that old. If they’re not careful, they might accidentally Facebook message one of their Randy * Fiends friends. At which time they will begin a cycle of never-ending payments to achieve a very, very shiny new face. 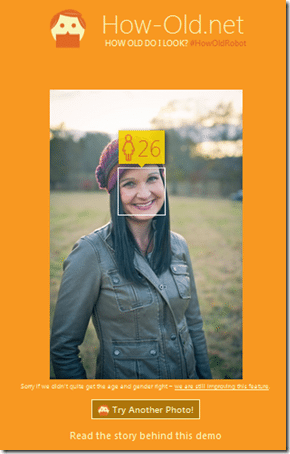 If, however, a person using how-old.net is not indicated as a target market, they’re given an age that is approximately 5 – 7 years younger than they actually look to help make the product look more genuine. And to further incite panic in their friends. This technique has proven to drive Rinchin = Fu sales up 25% in April, with May’s sales projected to be even higher. The FTC is currently investigating the website for defrauding the public. Disclaimer: This post is satire, parody, and completely untrue. Do not sue me, Roger + Fink. And anyway, I’ve picked on Essential Oils way worse. WAY worse.